An early version of the script of Prince of Persia The Sands of Time may have leaked online via IMDb. So have a look, but keep in mind that its authenticity has not been proved. The script, dating back to 2006, has been written by Jordan Mechner, with revisions by Jeffrey Nachmanoff. So it would be an early version of the screenplay of Prince of Persia. 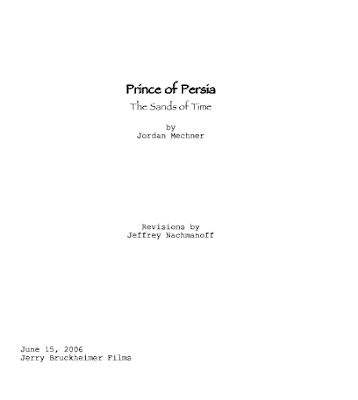 Because of the mention of Jerry Bruckheimer Films on the first page and the overall well written text I'm incline to think it is a legit script of Prince Persia The Sands of Time (but an early version, the final shoould not be that much different though). After flipping through the pages I have the impression that the movie will be close to the spirit of the original video game. What do you think? It should definitely be close to the PS2 version of Prince of Persia: The Sands of time. I too believe that 'The prince of persia games are definitely 10/10'! 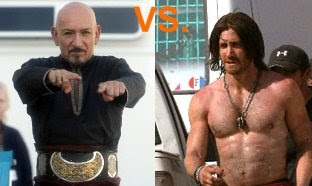 There is a strong storyline full of action and emotions and all the prince of persia fans will love this movie. I hope that the actors are great. I have lots of expections from the whole team & let's keep our heads up high to see them if the movie stays truthful to the games. I will also say its going to be 1000% better than all other movies. I wish best luck to the whole production unit and great outcome from the movie. I have full faith on you and I believe and appreciate your work. It is very reminiscent of the Prince of Persia sands of time epic. Despite differences from the game, I have high expectations for this film. I think fans of the series will enjoy this, even if others are bashing it already. Definitely, Prince of Persia stories are all inspiring!! !, i hope that they have visually amazing environments, just like the games, which can only be created using CGI. it is vey hard to wait anymore.